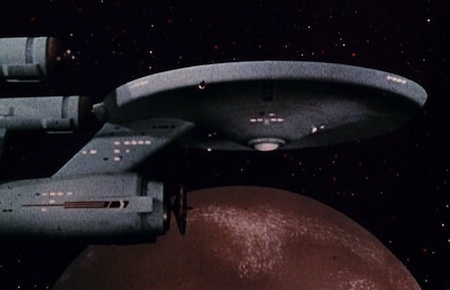 So many Star Trek episodes began with the Enterprise entering orbit about an alien planet; what adventures awaited the crew? Mission completed, the Enterprise leaves the planet under power, proceeding to its next destination. Although we are not yet at the point of exploring alien star systems, NASA's Dawn spacecraft is orbiting unexplored worlds in our own solar system. In this case, asteroids Ceres and Vesta, both discovered more than 100 years ago. 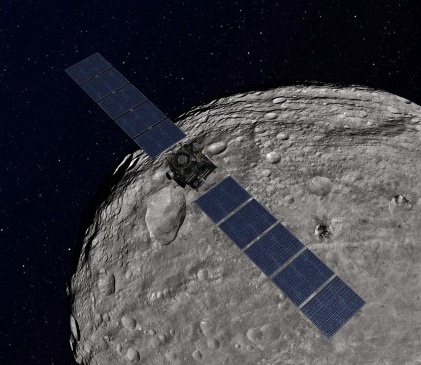 Now in orbit around Vesta, Dawn will use its ion engine to leave orbit and depart for Ceres this July, arriving in 2015. This makes Vesta a round baby planet—a 4.5 billion yr. old protoplanet whose structure, unlike asteroids, could not be shattered by the cataclysmic bombardment that occurred 4.1-3.8 billion years ago from leftover chunks of solar system formation. I stole the idea for this article from AmericaSpace; be sure to click through for more details. See also NASA's Dawn mission page.